A Cod fish, seems innocent enough, yet has created international fighting, gunshots, territorial wars and innovations that have indeed raped the sea. that over fishing would create. Their system of hooks and lines,fisherman in a dory boat, was a slow and tedious task I first learned of from “Captains Courageous” by Rudyard Kipling. The new system, so efficient it stripped the sea and population of a simple fish that fed the world. Bottom draggers became the economical way for fisherman to take a great haul of fish. So great a haul that few remain of a species. Disbelief that the Cod and a way of life was disappearing the fisherman continued to fight over the fishing grounds that lay off shore their native lands. The fish are so depleted, I feel a sense of guilt when seeing Cod listed on a menu, or offered in the market fish case. Mark Kurlansky has researched and gathered the history of Cod fishing into a very readable book. 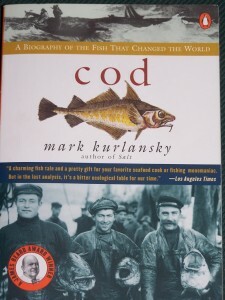 It’s pages filled with the everyday lives of fisherman and a timeline of world history as it relates to Cod. Kings and Queens, revolutionaries and enterprising men of the sea, all took part in the story of the Cod’s demise. Yes, Cape Cod, all of a sudden the name makes such sense, for her shores were lined with the fisheries, and her cities built on the sales of Cod. So innate to life on the Cape was Cod that the sea chantey singers had a tune about it! To tell you that she’s done. Mark Kurlansky has written a great book. I was so impressed with it I just had to share everyone.